We all know that panic-stricken moment. 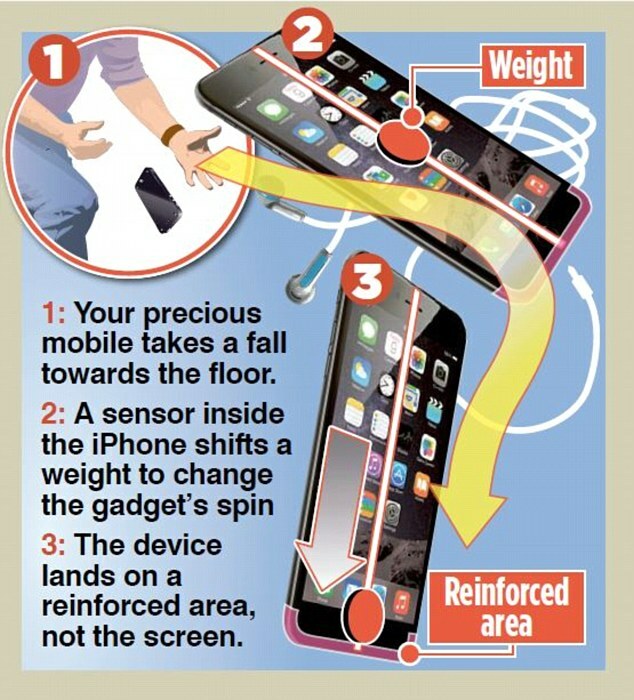 You drop your mobile and watch, aghast, as it plunges towards the floor, fearing it will land screen-side down – with shattering consequences. But now Apple plans to spare you that agony, with an invention that will stop your iPhone hitting the ground face-first. The technology giant was granted a patent last week on an invention that can detect when a handset is falling – and flips it to ensure the screen doesn’t hit the ground. The idea could also work with iPads and other devices. Apple’s design features on-board sensors that measure the speed that the phone is falling and predict when it will land and which side of the device will hit the floor. If sensors calculate a delicate component, such as the screen or camera, will hit the ground, a motor is instantly activated within the phone. This moves an internal weight fast enough to affect the ‘rotational velocity’ of the device and spin it around as it falls, so that it lands on a reinforced area. The effect is similar to how a falling cat always manages to land on its feet. And that’s not all. The patent even includes a system that would eject the headphone cord to avoid damage to the connector. Victor Seidel, a lecturer in science entrepreneurship at Oxford University, said: ‘This does what a lot of successful innovations do: combines ideas in a way others had not considered, such as adding gyroscopic action within a smartphone. Industry insiders say an iPhone featuring the new technology may appear within three years.